What a colossal mess hit and run artists Dwight Duncan and Dalton McGuinty created by mandating the end to the Slots At Racetrack Program, using false assumptions, without doing their homework first. With only 6 days until the end of SARP, the Ontario horse racing industry is still in limbo regarding race dates and purse structure and even location, when it comes to the future of the majority of racetracks. Never mind time is running out on another breeding season as well. It has become evident that even the Transition Panel has bitten off more than they can chew, having only landed racing agreements with not-for-profit tracks. They have been trying to broker deals since December, but hit a major speed bump. As I understand it, based on what has been put out there in the media and interviews, for-profit tracks have all signed deals with the OLG when it comes to renting out the slots facilities, however, if they choose to get a racing subsidy, rent counts towards their revenues, therefore, in most cases, if they don't race, they make money from rent, but if they race, the best they can do is break even. No matter how much a racetrack owner may love racing, if you are a businessman, you pretty much have no choice but to take the rent money only. Even if there is a possible rainbow at the end of all this junk, a track can always race again in the future if there are profits that can be made from racing. Can the government justify giving a for profit-track a profit using tax dollars? That is question that we will see answered in the next few days....maybe. I don't understand how the brakes weren't applied on the end of SARP. The lie by the quitter Dwight Duncan, that there were only 5,000 people in the industry was enough evidence for the government to back down on the decision until further due diligence was done. And then when OMAFRA came up with their conclusions that a major subsidy would be required to keep horse racing on life support, considering all the potential lost jobs, a capable government would have just adjusted the SARP program. But the inept, larcenous McGuinty government was still calling the shots back then. And now, we are seeing major resistance when it comes to putting a new casino just about anywhere. What this really is saying is that will of the Ontario people are OK with casinos at tracks, in other words, tracks are perfect business partners when it comes to OLG slots, and they should be treated as business partners. Is there time for a solution? I'm not sure. With the OLG already accepting RFP's for Gaming Zone operators to step in and replace many of the overpaid overcompensated OLG workers, I'm not sure that if a new government was elected today, that they can stop it. But then again, I'm not a contract lawyer. I've had plenty of time to think about solutions. I don't think giving a subsidy from tax dollars is acceptable at all, nor does it address the future beyond two or three years, as well as there is no incentive for for-profit tracks to continue. What would I do if I was Premier Wynne? I would extend the SARP program for 4 years, giving ample time to integrate a possible horse racing lottery, sports betting, Instant Racing, etc. as new sources of revenues so that horse racing can stand on its own. It is my belief that slots are dying a slow death anyway, and racing needs to market horse racing as a competitive gambling game. I would change the SARP program to 7% for horsemen and 7% for tracks (this saves face sort of). The reality is that at least a good 20% of the industry is gone at this time anyway thanks to the past year's uncertainty. I would mandate that the entire horsemen's share of slots goes towards Ontario bred races and breeder incentives. This eliminates the $30 million government subsidy, as well as the necessity of the extra 2% the TIP program receives from wagering (which inhibits tracks from experimenting with lower track takeouts). Too much of slots money went to foreign players. Nothing wrong with reciprocation, but it was way too much and took away from Ontario breeders and owners and trainers. Betting revenues can be used to fund open races very effectively. I would mandate that of the 7% tracks receive, that 33% of it is used towards local marketing and province wide marketing and developing. The balance is to be used for racing operations and some of it will be profit (for for-profit tracks). I would split racing gross revenues for live racing 55%-45% for the horsemen-racetracks, the same split for home market (simulcast and exported) wagers based but using net revenues instead. I would also add that if a track decides to rebate their home market customers, that 45% of the rebate is deducted from the horsemen share as this incentivizes the tracks to do this which will be great for growing the customer base. I would mandate that track takeout for Ontario horse racing can not exceed 16% for WPS, 19% for Doubles and Exactors, and 22% for all other wagers (this includes the 1.3% the government receives). This will allow Ontario tracks to compete with all North American tracks and handle and customer base is sure to grow. Even Ohio has a 22% cap on takeout. Allow tracks to be able to match offers from outside operators in order to run their own casinos. If they can run pari-mutuel wagering, they should be able to handle slots and table games too. Finally, I would offer slots back to Windsor, Sarnia, and Fort Erie. Taking slots away from these tracks didn't help the numbers at the stand alone casinos. In fact, Windsor casino just announced major layoffs today. If it means that under the 7%-7% proposal, along with slots, that Fort Erie can only race 40 days, so be it. If everything I've put out here is done, horse racing will grow, and Fort Erie dates will eventually grow too. Update: Wynne just announced that there will be racing at for-profit tracks Fort Erie, Flamboro Downs and Georgian Downs. Horse racing in Ontario is still in the Wild West despite yesterday's announcement by Temporary Premier Kathleen Wynne who stated she "wants" to see horse racing to be part of the OLG's Modernization Plan. The good thing is that this is a definite policy shift by the beleaguered (very well deserving) Liberal government, but when you consider that the OLG is strongly considering privatizing everything (something the PCs, the number one opposition party in Ontario, also would like to see) and the fact that the Liberals may not be in command a year from now, if horse racing doesn't come together extremely quickly get the ball rolling with specific signed deals, what Wynne stated yesterday might only be nothing more than words of appeasement. Horse racing in Ontario is good to go for the next 3 years (at approximately 75% of what it was last year), running on monies generated from betting and an actual government subsidy that will mostly be used to pay for racetrack expenses other than purses. Since tracks don't charge admission (if they did right now, no one would go), don't make much off concessions, and other than a handful of Woodbine races, the don't receive any corporate ad monies, their only source of income is through betting, now that slot revenues are no more. One question of many I have is that Wynne stated racetracks have three year deals with the government regarding subsidies, yet Woodbine stated they have a two year deal. Which is it? The biggest question right now for Ontario horse racing to immediately deal with is who is going to represent it when it comes to selecting and implementing new revenue streaming ideas that will definitely need to be in place two or three years from now in order to ensure that horse racing remains viable. Horsemen groups historically in Ontario have had a huge sense of entitlement, and even with the dose of reality that has happened over the past year, I have read many recent comments by horsemen who basically state that nothing other than reinstatement of the SARP would be acceptable. They are definitely not customer driven, and horse racing's biggest problem right now is that they don't have nearly enough customers. Racetracks are supposed to be customer driven, but because of slots revenues, customers were placed at the back of the bus. So who is going to lead horse racing into the future, and can there be a leader with all the childish infighting that happens? Whoever it is will definitely need to start understanding the gambler's psyche, if horse racing is survive and potentially grow. Something I do find a bit troubling is that since the SARP got its walking papers from Ontario racetracks, I have yet to see anything substantial from any Ontario track that would make me want to gamble on horses more, with the exception of HPI allowing some fractional wagers to coincide (almost) with some US tracks, but that was something they were working on prior to the end of SARP. I realize that the whole industry has been suffering from deer in the headlights syndrome for a year now, but there has been no takeout reductions the past 365 days, and comparatively, especially harness B tracks, takeout rates compared to US tracks are sky high. The biggest complaint I hear about from friends is not getting paid track odds on many US exotics. 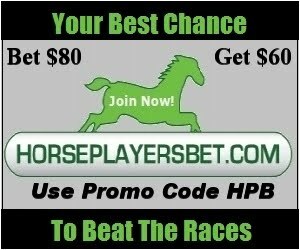 Smaller bettors may not care so much about this, but the bigger bettors do, and all this practice does is chase them away, and racing like many businesses runs by the 80-20 rule where 20% of the customers do 80% of the betting. Ontario horse racing's future is now dependent on having more customers. The problem horse racing has is that it has too high a learning curve for a game that is perceived as unbeatable (thanks to high takeout rates). Slots is a no-brain required type of gamble that gives the player the illusion of winning, even when they are not, and even though slots is not beatable ever in the long run, it awakens the same parts of the brain as crack does for crack addicts. I find it sort of disgusting the Ontario government is actually looking to expand slots to where there are more people and especially on the internet, but I'll save most of my thoughts for a future post. Poker found success because it is perceived that if you are good enough you can actually make a living as a poker player, which means that there is a perceived chance that even a casual player can make some money long term. The learning curve is nowhere near as much as horse racing, and the cost to learn is nowhere near either. Racetracks in Ontario need to lower takeout and give gambler's more psychological satisfaction. The more they have in their wallets, the more they tend to play, the more they tend to come back. The best way for horse racing to draw in more customers is to have a weekly lottery similar to the V75 in Sweden. This can bring in a whole new audience of lottery players who may be inclined to learn more about selecting horses in individual races. But the powers that be, whoever they are, need to think ahead about keeping these customers once they have them. In order to be succesful, I think the lottery would need to hand out at least $1.5 million on non carryover weeks as a grand prize. This would mean some pretty aggressive marketing at lottery kiosks across Canada, and it is something that could easily attract US bettors at racetracks and ADWs. Instant Racing (historical racing machines) is another way to generate more revenues and possibly attract new fan interest. They aren't slot machines, but they appeal to the same type of crowd. The 10% takeout ensures high churn and gambler satisfaction, and these machines have been very successful where there are no slots to compete with (hint: Fort Erie). As for poker rooms, expanded gambling (roulette, blackjack, etc.) and sports betting, I don't see the justification of a gaming partnership with the OLG for anything other than racetrack related gambles is any different than the slots agreement that has now ended. I find it an insult to my intelligence that the OLG is supposed to partner up on all other gaming except slots in order to help out the horse racing industry, and yet the Transition Panel has stated that this is a possible solution, while saying the slots program was wrong. Besides, there is little money that can be made from sports betting and poker (too labour intensive) to satisfy the needs of operating a racetrack. So right now, there is more hope than there was a couple of months ago, but the industry better get their act together, get signed commitments from the OLG and Ontario government, and get these future ideas rolling NOW!